So it was a very joyful reunion when I finally joined my family. My kids were very happy to see me and I was very happy to see them. – Those are the words I wrote when I started to make my first blog entry while I was in Spain. That’s as far as I got. I was too busy to spend time sitting behind a computer writing blog entries. I am now in the airport waiting for the plane to take us home. (actually, now I am finishing this entry on the subway ride to work). My god how time flies when you are having fun. I must say though, that I was my sense of time was in some sort of hyper drive. I suppose staying right next door to a church whose bells went off every 15 minutes of the day didn’t help. But that is how time is; it slips through your fingers like grains of sand. Since this is a training blog, I will primarily recount my training activities. I ran 116 miles, hiked several more and swam 13 miles. All of the runs were in the mountains where I climbed 1000’s of feet for each one. The swimming was great as well. I took pictures everywhere I went. The land is rugged and beautiful. One of my runs saw me run straight up 1500 feet in the fog covered mountains. As I submitted the mountain I began to hear what sounded like low planes flying over head. It wasn’t until I realized that the sounds of the planes were going away that I realized that what I was hearing were windmills. I made several friends while running. 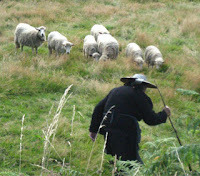 Typically little old ladies tending cattle or sheep. One of them was nice enough to take a picture of me with some pigs. The following are some of the sights I saw while running. Here is Little Bo Peep in case you were wondering what happened to her. 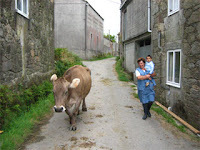 On a mountain farm walking the cow. Up in the mountains by the Windmills. One of the first things I did with my children was to take a hike up a mountain trail that I discovered while running. I came across it at the end of an out and back road. I had started to run up it while doing a run, but it was too steep and over grown with brush for a run. I wanted to find the top so I vowed to return later on. I returned with my children in tow and I carried a backpack filled with snacks and water. The trail meandered up the side of a mountain, bringing us closer to a bunch of windmills that were on top of the mountain. As we climbed, the brush started to thin out and the trail became rocky. We had climbed above the tree line. We were treated to magnificent vista’s of the town and water below. It was truly a sight to behold. As we started getting closer to the windmills, my daughter started to have some angst about proceeding any further. I must admit it was kind of creepy up there. The wind was howling and the sounds of the windmills slicing through the air made an eerie noise. I insisted that we keep going forward as I suspected we were only within 50 feet of a windmill and it didn’t pay to stop right now. We eventually made it to windmill number 37. Then we settled in for the long hike back down the hill. All totaled it was a 3.5 mile hike. Swimming – La Cueva – There is an island in the distance from the beach where everyone goes. I vowed to myself to swim to it at some point while I was there. Unfortunately, there was boat traffic in the water so I had to be very careful when swimming. I stayed close along the shore which was the long way to get to the island. When I reached a point that was closest to the island, I opened up my stroke and swam hard across a small channel to make it to the island. It was a satisfying feeling to know that I did it. I explored the island for a little while. On it I saw dozens of star fish. I would have liked to have brought one back with me, but I didn’t have any place to carry it. My daughter told me I shouldn’t have brought it back in any event, since it would have died being out of its natural habitat. Spain is a very beautiful country and I am taking my opportunities to swim and run in it. 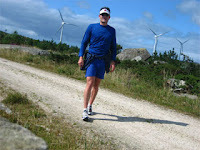 The running has been great, with lots of mountains to climb. I only wish I had my bicycle. That would have been perfect.